Geared to any health care professional practicing in or rotating into a CCU, this quick referenceadopts a similar format to the author’s highly regarded Cardiac Care Unit Survival Guide. 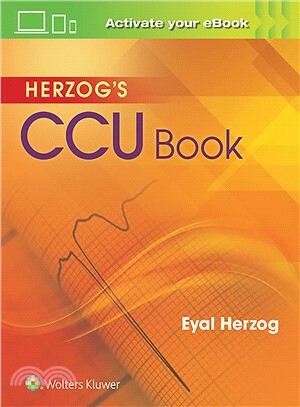 Packed with full-page diagnosis treatment algorithms and management pathways, Herzog’s CCU Bookensures you acquire in-depth knowledge and understand the subtleties in treating the different kinds of patients you encounter in a CCU setting. Richly illustrated algorithms and pathways for making accurate diagnosis, treatment, care management, and patient education decisions. Organized to help you quickly access pathophysiology, epidemiology, testing, and therapy information for angina, acute coronary syndrome, arrhythmias, organ failure, and other cardiac conditions. Perfect for physicians, residents, cardiac care and critical care nurses, physician assistants, and other CCU practitioners. Identifies what you need to tell the patient and family members about the patient’s stay and condition. Edited by the Director of the CCU at St. Luke’s Roosevelt Hospital Center and author of Lippincott Williams & Wilkins’ The Cardiac Care Unit Survival Guide.